Ectroma rufum, from the Taiwan Agricultural Research Institute. The Ectromatini have been recognised as a subgroup of the chalcid family Encyrtidae; however, their classification has been altered by the recognition that the type species of Ectroma was mischaracterised. [G26] Girault, A. A. 1926. 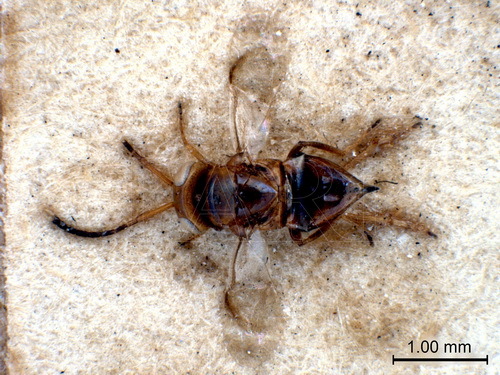 Hymenoptera minutae nova Australiensis. Privately published (reprinted Gordh, G., A. S. Menke, E. C. Dahms & J. C. Hall. 1979. The privately printed papers of A. A. Girault. Memoirs of the American Entomological Institute 28: 196).